If you buy 100k United miles for 1.15 cpm, and sell at 1.4, that’s a $250 profit. Not bad for about half an hour of work, huh? This is real, and it’s going on now. United Airlines Miles is currently selling for 1.4 cpm on the Urwex marketplace. So how do you get United miles as cheap as 1.15 cpm? This one requires some luck. Until November 12, the Choice Privileges Program offering 40% and 50% bonuses if you buy 5,000 or more points at a time. The catch is that the promotion is targeted, meaning that you are not guaranteed a 40% or 50% bonus. You can click here to check if you’re eligible for the bonuses. If you’re not, don’t worry! I’ll let you know how to get your cheap United miles in a later section. New accounts should receive a 30% bonus right off the bat. You can purchase a maximum of 50,000 Choice Privileges points annually, excluding bonuses. These purchases are processed by points.com, so make sure you’re using a card that maximizes everyday spend like American Express Platinum or Business Platinum Cards. Usually, the transfer rate from Choice to airlines is 5:1. However, right now, there’s a promotion that allows you to transfer 5,000 Choice Privileges points to 2,500 United Airlines. That’s a bonus of 150%! You have to transfer in 1,000 point increments with a minimum of 5,000 points. This promotion ends November 30th. Additionally, United is offering a bonus of 30% to those transferring points form hotel programs, including Choice. You can earn a maximum of 25,000 miles this way. Before transferring your points, remember to register your United account for the promotion. You can do it here. 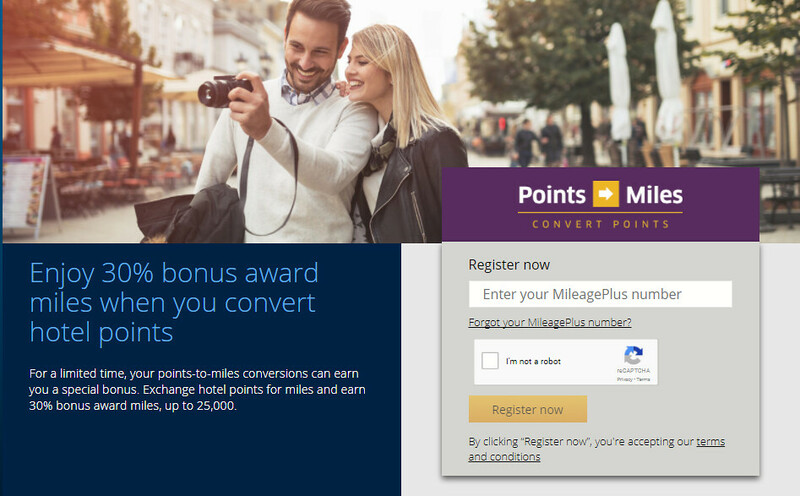 If you have 0 miles/points with both programs, you can still buy 65,000 Choice points at a 30% bonus, and convert them to 42,250 United miles at 1.289 cpm. 75k Choice Privileges points will cost $550. Transfer 75k Choice points into 37,500 United Airlines miles. United will give you a 30% transfer bonus of 11,250 miles, bringing your total miles to 48,750 United miles. You can take your 48,750 United miles to the Urwex marketplace and trade them at a rate of 1.4 cpm. The first thing to keep in mind about this technique is that the Points Plus Cash Rewards Nights offer disappeared from Choice Privilege’s online site in May. However, if you are able to get the right rep on the phone, you can still buy points at the discounted rate. Choice Privileges members can get discounted rates on miles to complete hotel bookings through Points Plus. On bookings that require 10,000 points or more to redeem, you can use 8,000 points and buy the remaining points needed at $7.50 per thousand. $7.50 is down from the usual rate of $11 per thousand. With Choice Privileges, you can book a reward stay at a hotel, cancel, and the points will be deposited into your account. If you cancel your reservation in accordance with the hotel’s cancellation policy stated on your reservation confirmation, all points used for the reward night, including those purchased through Points Plus Cash, will be re-deposited into yourChoice Privileges account. Using this technique mitigates one of the main issues with the Choice Privileges program. There is a 20,000 point limit on how many points you can buy annually. However, through Points Plus Cash Reward Nights, you can purchase up to 250,000 points per year. The book and cancel trick is a great way to grow your account balance. If you have 16,000 points, you can book a 2 night stay at a 25k/night hotel. With Points Plus, you can use the booking to buy 34,000 points at $7.50/1,000 points, for a total of $255. When you cancel the booking, you’ll have 50,000 points in your account. Because United’s transfer bonus promotion is limited to 25,000 miles per account, the best value can be had for 166k Choice points. You can convert 166k Choice points into 83k United miles, and the 30% transfer bonus will net you 24,900 miles. There is no index on the Choice Privileges website for how many points are required for each hotel booking. This can make getting to exactly 166k points a bit of a chore. The points requirements for hotel bookings are not a secret. Anyone can search for Choice Privileges hotels in a given city and select "Choice Privileges Reward Night" as the rate type. You'll see all the Choice properties in the city and their points cost (if rooms are available). You cannot book reward nights far in advance. Members who have not yet achieved Elite Status must make their free night reservation personally through the Program Line or through their online account no more than 30 days prior to planned arrival for stays in their country of residence. Sixty days prior to their planned arrival at all other locations worldwide. That means you must schedule your booking fewer than 30 days in advance. 166k Choice Privileges points will cost $1,245. Transfer 166k Choice points into 83k United Airlines miles. United will give you a 30% transfer bonus of 24,900 miles, bringing your total miles to 107,900 United miles. You can take your 107,900 United miles to the Urwex marketplace and trade them at a rate of 1.4 cpm.